3D printing technology is revolutionizing industrial and consumer markets alike by allowing the creation of parts and products that cannot easily be made through traditional manufacturing. Industrial manufacturers use 3D printers to produce automotive parts, dental implants, product prototypes and prosthetics, whereas consumers welcome the ability to design and customize items like jewelry, toys and shoes. Most importantly, the growing adoption of rapid prototyping fuels constant innovation and improvement in 3D printers, in turn slashing manufacturing costs and making the technology increasingly accessible. 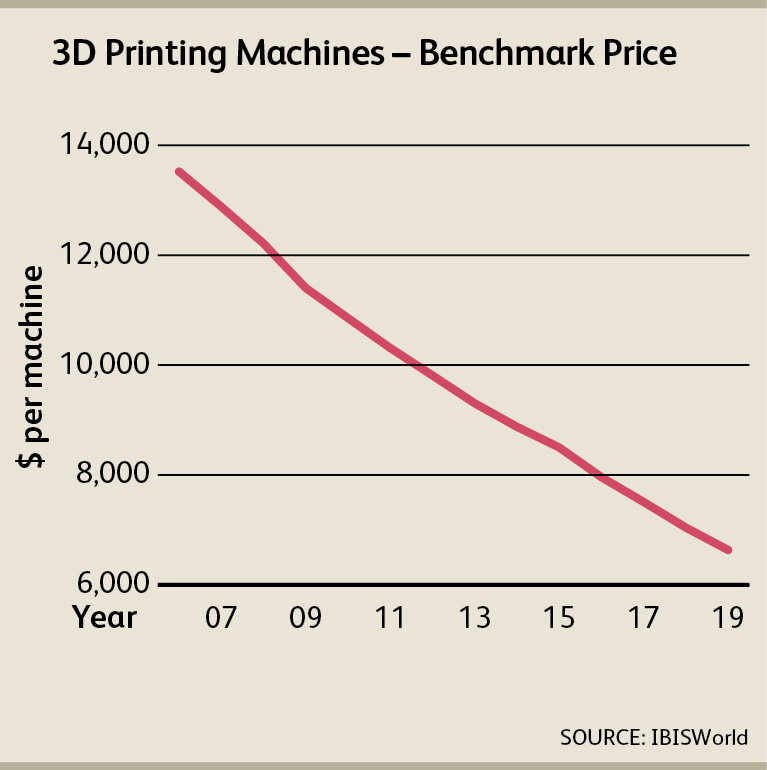 According to IBISWorld estimates, the price of 3D printing machines is anticipated to fall 6.4% in 2016. On one hand, greater private investment in industrial equipment and machinery has signaled that buyers are increasingly allocating funds toward purchases of 3D printers, among other types of equipment. 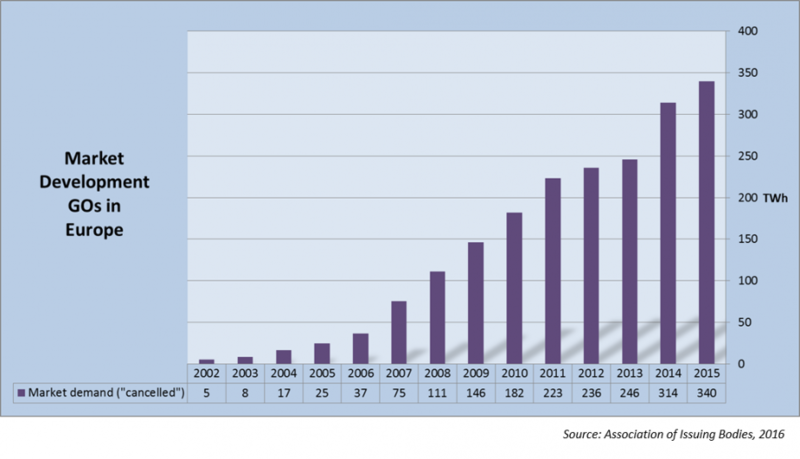 In addition, rising R&D expenditure has fueled the need for 3D-printed items. On the other hand, the cost of raw material inputs, such as aluminum, have been declining during the period due to weaker demand. As a result, suppliers have been able to cut prices without undermining profit margins. Moreover, mounting import penetration, strong competitive pressures and technological advancements have pressured prices downward. This trend is projected to continue through 2019, with prices anticipated to decline at an annualized rate of 6.1%, while 3D printer sales grow robustly on the back of increased affordability and versatility. Although market leaders Stratasys Ltd. and 3D Systems Inc. together account for more than 55.0% of total market revenue, the ongoing influx of new vendors has boosted competition and has facilitated price decreases. To maintain their market share, leading suppliers of 3D printers have been increasingly engaging in M&A activity to gain access to innovative technology and software solutions, as well as to establish their presence in emerging markets. Meanwhile, the presence of foreign-based vendors has also expanded strongly during the period, further intensifying competition and benefiting buyers. However, it is important to note that not all buyers benefit equally from import penetration. This is especially true for buyers with niche uses for rapid prototyping, such as biomedical and defense firms, because there is a limited number of vendors capable of supplying higher-end printers. Demand for 3D printers will strengthen further through 2019 as new applications are constantly developed for these machines. Improvements in 3D printing technology will allow suppliers to manufacture and assemble printers at lower costs, enabling further price reductions. Declining 3D printer prices will prompt innovations at a faster rate in downstream markets, making customization the new norm for a wide variety of products. While ongoing product change will improve the performance of 3D printers, buyers will be at increased risk of procuring machinery that may rapidly become obsolete. As such, IBISWorld advises buyers to procure 3D printers on an ad hoc basis. Agiimaa Kruchkin is a lead business research analyst at IBISWorld’s Procurement Division in Los Angeles, which specialized in market research that encompasses price trends, major suppliers, supply chain risks and more. Kruchkin holds bachelor’s degrees from Pepperdine University. The research featured in this article can be found at http://www.ibisworld.com/procurement.